"Do we really need libraries anymore?" "Nuts and bolts shape the library's unique design"
"Divining the cost of an oddball building"
"Intuitive design yields unlikely results"
"Library's tech system is also daring and elegant"
"Libraries: the next must-have amenity"
"Dozens of library projects on tap for Seattle, King County"
"Living rooms for urban neighborhoods"
"Neighborhood libraries get big-city treatment"
"College libraries cater to widening needs"
"Library lights lift a heavy load"
The Seattle Central Library stands near completion, viewed from the northeast corner of Fifth Avenue and Spring Street. 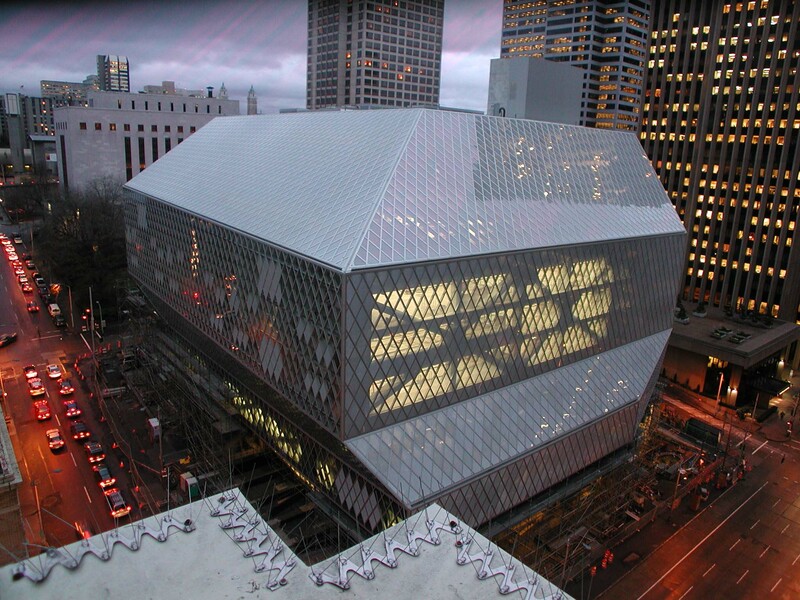 The new central library is the stylish centerpiece of Seattle Public Library’s $196.4 million “Libraries for All” program. Designed by Pritzker Prize-winning architect Rem Koolhaas, the library’s angular glass exterior houses a unique offset-platform system that organizes the building. The staff platform at the library’s base includes the colorful children’s area and an English-as-a-second-language room with maple flooring carved with texts from around of the world. A 275-auditorium connects to the living room, a soaring space that visitors can enter from Fifth Avenue. The assembly platform comprises the meeting-room floor — a sensuous red cocoon — and supports the hub of the library, the mixing chamber. The books platform includes the nonfiction collection, which is arranged along a spiral that leads to the reading room, where visitors can enjoy dramatic views of the city and Puget Sound. Above, the headquarters platform contains office and conference space. 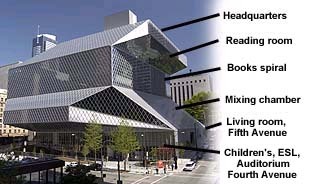 King County, over the past 15 years, has seen a boom in library construction. With more projects to come, this Seattle Central Library special section also looks more broadly at library design and construction. ADA: McGuire Associates, Newburgh, N.Y.